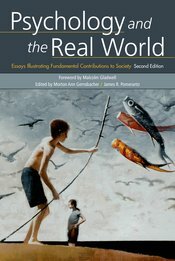 Psychology and the Real World gives students the opportunity to learn about some of the most important psychology research of our time from the best possible sources—the actual scientists behind the studies that have not only reshaped our understanding of brain, mind, and behavior, but have significantly changed the way we live our lives. In Psychology and the Real World, each contribution is an original essay written exclusively for this project, with the “Who’s Who” gathering of authors explaining, clearly and passionately, the work they have pursued and what it means to us. With new and updated essays throughout, the new edition again exemplifies the broad scope and life-changing benefits of contemporary psychological science. The authors have volunteered their contributions and have agreed that royalties will go to FABBS to support their educational mission. The book is affordably priced to students whose instructors adopt one of Worth’s introductory psychology texts and Worth is returning all of the revenues so earned directly to FABBS.